In this series of webinars, Berkshire compliance experts will help contractors prepare for this new type of compliance review. The webinar series will start with a one-hour overview. In the first session, Lynn Clements, a former OFCCP and EEOC official who now serves as the Director of Regulatory Affairs at Berkshire Associates, will explain how contractors will be selected for a focused review and what contractors can expect if selected for a focused review. 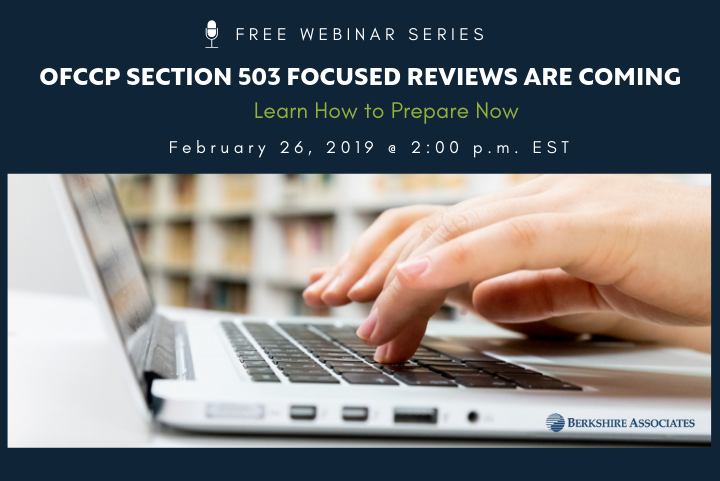 The first webinar will review the Section 503 compliance items that are checked by OFCCP during all compliance reviews and provide practical tips on how contractors can prepare for a focused review of their Section 503 practices.